PatronManager’s powerful fundraising, ticketing, and CRM system for theatres, performing arts organizations, and non-profits gives you the power to run your individual and institutional fundraising campaigns, while connecting it to your other patron data. 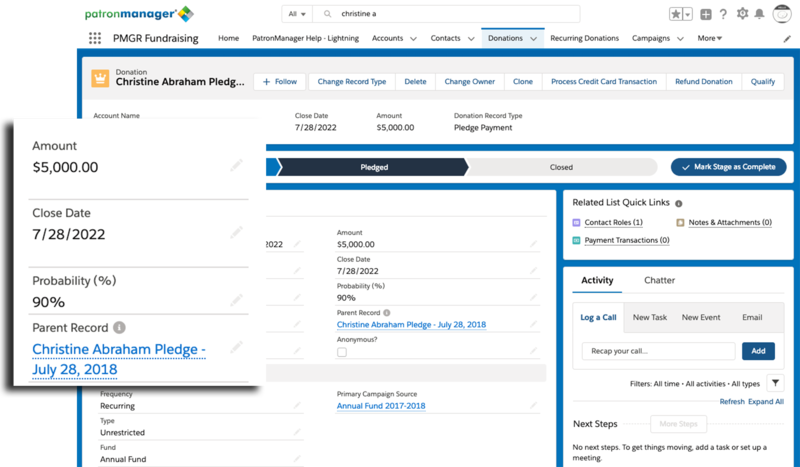 Built entirely on Salesforce, our system will improve your ability to track, manage, and cultivate relationships with your donors to support your organization. Our system consolidates your non-profit’s ticketing and donor management data into one solution, so you never have to worry about scattered information. 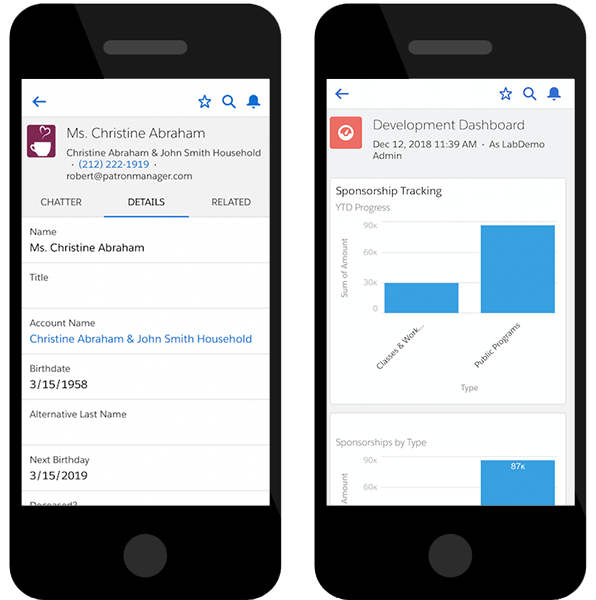 With intuitive online donation forms and a suite of tools for soliciting donors and managing progress, you'll have a complete 360-degree picture of your donors available in seconds. 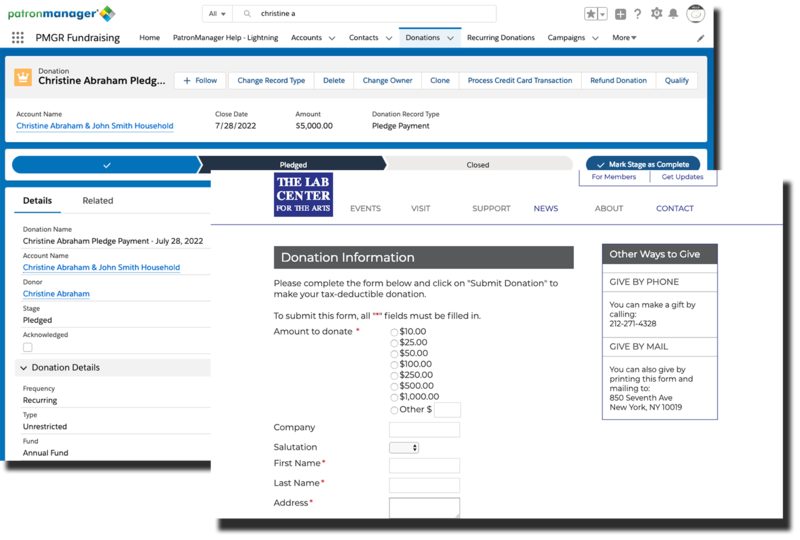 Create and customize your donation and patron management to quickly allocate patron contributions to your various funds and appeal structures. Manage and track individual giving, corporate sponsorships, foundation grants, special events, and other contributed revenue streams with specialized processes for each. Use our system’s powerful, customized reports to instantly view your fundraising results and goals. Run cross-departmental reports about your patrons’ buying and donating habits, create robust custom charts, and set select reports to be emailed to your team automatically. Our ticketing and fundraising software puts your entire business in your pocket, enhancing your own efficiency and flexibility. The streamlined mobile application for your phone and tablet lets you access your data anywhere, so you can perform essential tasks and capture important details about your performing arts events from our system while on the go. With our software, you can also effortlessly sell tickets, subscriptions, and memberships for your performing arts venue online or at the box office. Customize our software to fit your exact needs so you can better understand your audience and ensure the success of your events. We’ve had a 33% increase in contributed income and a 21% increase in paid attendance while using PatronManager. Additionally, the system is user-friendly, intuitive, and easy to train new users.